The Translator’s Training Course (TTC) is a 4-module course that provides training in translation principles, Bible background, study skills and language discovery. Participants attend as a team representing their language/tokples. Each team is assisted by a mentor. 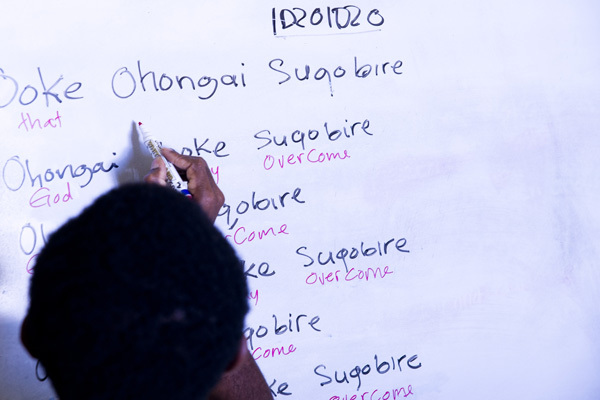 Teams of Papua New Guineans work together on Scripture translation. Each team needs to have at least two participants from the language community and a mentor who is able to be there in the course and provide on-going support between courses. 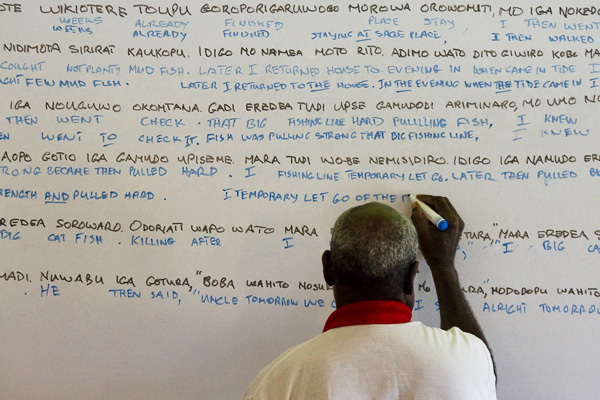 Pacific Institute of Languages, Arts & Translation (PILAT) coordinates the course and it is held in Ukarumpa, PNG. TTC is finishing this current session. Pray for the teachers and students as they learn valuable skills. 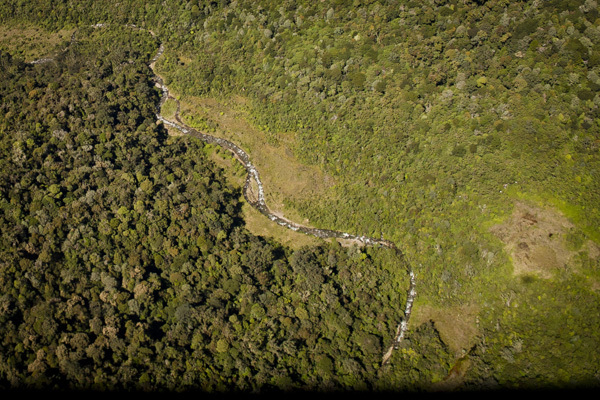 Pray that they can go back to their villages and complete the assigned tasks needed to advance to the next course. Getting the job done is almost always easier when there are a lot of willing helpers. These men are helping unload boxes of New Testaments from a helicopter on an island off the coast of Papua New Guinea. 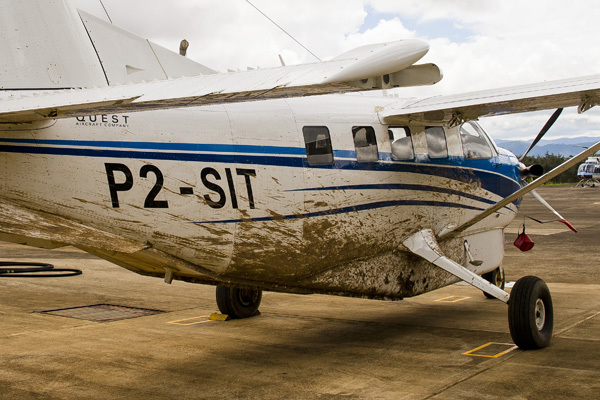 A plane brought them to that remote airstrip to be loaded on a helicopter. The store/shipping department in Ukarumapa, managed the logistics of getting them from the overseas printer to the airstrip while mechanics maintained the planes and the clinic, autoshop and school cared for the personnel who did all this work. The children’s home took care of the children who needed to attend the school while the parents were away. I could go on but I think you get the picture. It takes many more people than just the translators and language development workers to get a translated New Testament to the people. 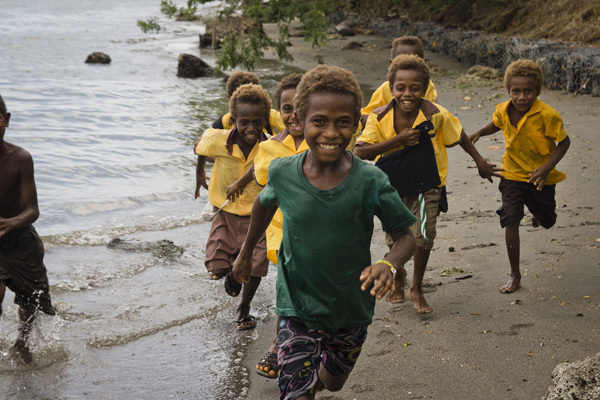 Pray for the many people involved in this process so that God’s Word could be heard in communities across PNG. Not all landings are smooth. 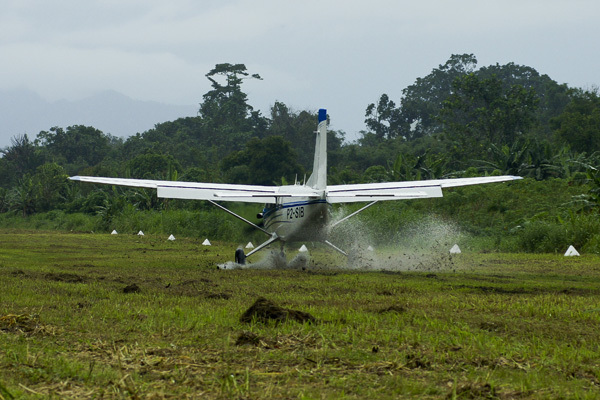 Not all airstrips are dry but the planes still have to get there. Like many jobs, there are times when getting the work done gets messy. Sometimes the difficulties of the job create unforeseen circumstances and challenges for translators and the workers who support the translation process (like pilots, school teachers, medical personnel, auto mechanics, managers and many more – but that’s another story). Pray for these individuals and teams that strive to bring the Word of God to the many people groups in Papua New Guinea. Pray that the work would be done well, while maintaining healthy relationships. One day Kossac, James and the rest of the team of the Kamano-Kafe translators were sitting at the table with Rich, their translation advisor, brainstorming. They needed some good readers to help with their audio recording of the recently translated New Testament. It was the goal of the team to provide a clear recording of every translated book to accompany the written version, to help their traditionally oral community understand God’s Word as clearly as possible. So far the recordings had been a resounding success, loaded onto hand-held, solar-powered “Audibibles” which were durable enough for the village setting. But, finding enough fluent readers wasn’t always easy. “Quick,” Kossac urged, “Get in the bus!” And the two of them went to the Kamano-Kafe recording studio where they spent the day recording. The next day, the plant opened back up again, and the man was able to return to his regular chicken runs. “God shut the chicken plant down, just so we could finish recording,” laughed Kossac. 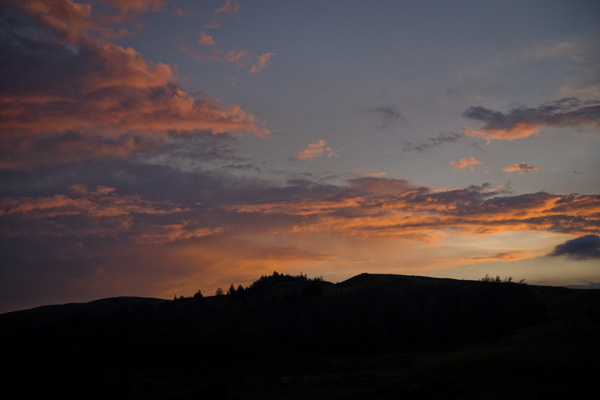 I often think about sunsets and sunrises as we have a great view of both. While the rest of the day gives us glimpses of beauty in different ways, like high billowing white clouds or gorgeous blue skies, it is at the beginning and end of the day that we see the spectacular displays of colour. Perhaps its because at the beginning of the day we need reminding of His work before us and the encouragement of a job worth doing. The end of the day brings us the reminder of the satisfaction in the beauty of a job well done. Pray today for the beginning and the end of the day. For the energetic starts and the satisfied finishes that Bible translators and Language developers in Papua New Guinea need in order to feel that the day is going to be, and was worthwhile. For those who are feeling that this wasn’t one of those days, pray for God’s hand of blessing and encouragement. While it is not a race, it is important to translation teams all across Papua New Guinea that the work being done in translation projects, keeps on track! Why? Because many language groups still have more work to do. Most translations that are completed still need the Old Testament, study materials and in some cases, revisions. So pray that the translation teams that are working diligently to keep pace would be able to run the whole race with endurance. 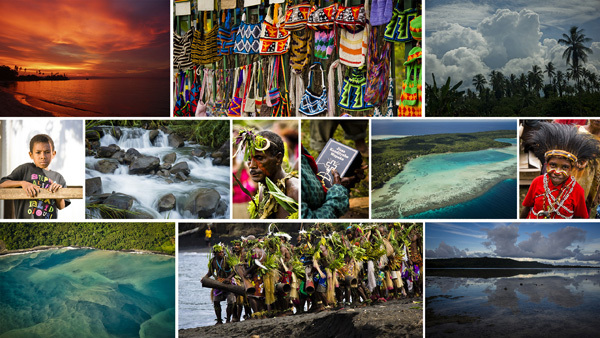 There is no one perfect image that can capture Papua New Guinea. It is a diverse country in so many ways. Breathtaking views of the land, sea and skies, along with the many different cultures and peoples, make this one of the most colourful places on earth. 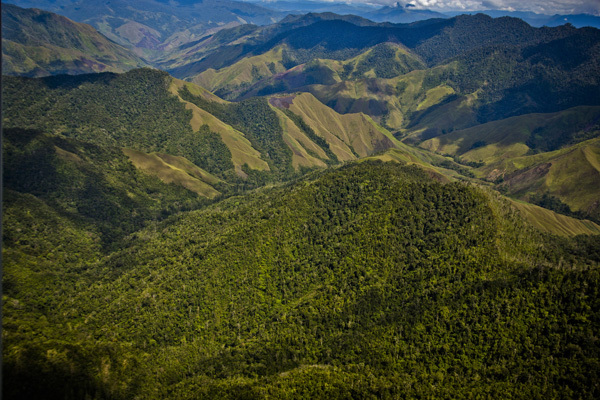 Pray that this beautiful land and people will soon see a language project started in every people group that needs one.